We test out a new set of Chinese radio triggers with an adjustable "HS Flash" high sync speed mode. Have you ever found yourself getting black bars across your picture when you use flash at shutter speeds above 1/250 second? This is you reaching the maximum sync speed or “X-Sync” of your camera. While there are cameras out there with faster leaf or electronic shutters, such as the Fuji X100, Canon G1X and Nikon D40, in general most DSLRs and professional cameras have focal-plane shutters limited to about 1/180 to 1/250 second when used for flash photography. Using proprietary system flashes with high speed sync (HSS, or “FP Sync” in Nikon-speak) you can synchronise all the way up to 1/8000 second. However, if you have a third party flashgun or mains-powered studio light then chances are that you don’t have access to this feature. What do you do? “HyperSync” is a workaround first introduced by PocketWizard in their ControlTL system. By tricking your flashes to fire earlier than usual, you can trick the flash pulse (usually at full power) into lasting for the exact period the camera shutter is open. It can allow sync up to 1/8000 second. The applications of this are fashion and sports photography where you want to freeze action but need more light output that small speedlights can usually offer (without ganging dozens together). PocketWizards also give you lots of other cool abilities like wireless TTL. But if you don’t need or want this then you might feel reluctant to pay a premium for features you won’t use. The FlexTT5 Transceivers cost US$219 each, after all. You also need to plug your unit into a computer each time you want to tweak the HyperSync settings, which might not be an ideal situation. What’s the alternative? The Commlite ComTrig H550. It is a 2.4GHz transceiver trigger made by the company originally behind the Ojecoco H-550 we tested pre-production models of late last year. 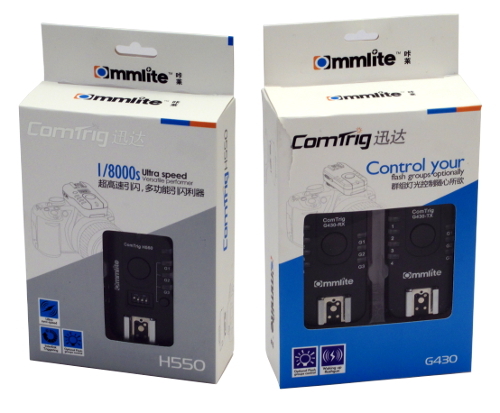 The ComTrig H550 doesn’t have TTL, FP Sync or a long-standing reputation like PocketWizards, but it does have its own version of a 1/8000s “ultra speed” hack called HS Flash mode. The operating range is said to be 150 metres. In addition to the H550 transceiver, there is also a cheaper ComTrig G430 transmitter-receiver kit which is fully compatible. A G430-TX transmitter can’t initiate high speed triggering itself, but G430-RX receivers will sync perfectly when set off by an H550 in HS Flash mode. Commlite sent us some samples of both triggers to review.